Fill out the following form and click on the the SUBMIT button at the bottom. You should hear from us within 24 hours (we may not respond on week-ends and holidays). If you don't get a reply, we may not have gotten your order! Every Time Machine is hand-built to your order. There is sometimes a short lead time to fill a new order. Click on the item name to see a picture of that item. A universal controller for digital photography. 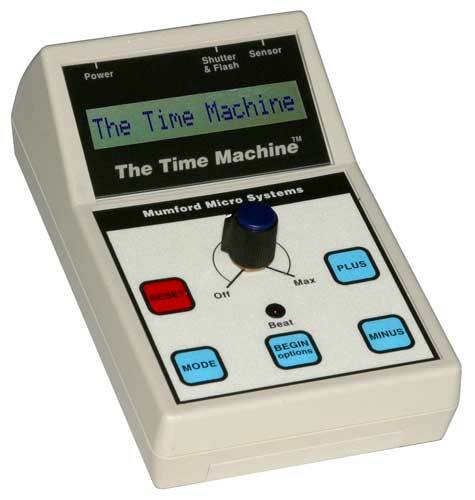 Includes the Time Machine, 9 volt battery, AC adaptor, and instructions. Can be used with sensors, ballistics, time lapse, water drops and splashes. 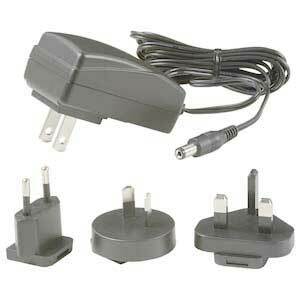 Foreign orders: We can supply a "universal" AC adaptor that works on 100 to 240 volts, 50 or 60 cycles. It comes with four different plug types. 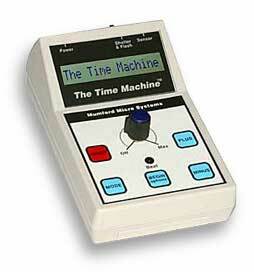 The Time Machine (see above). The Drip Kit (see below). Cables to connect your off-camera flash to the female PC jack of the Time Machine. If your flashes have no sync jack, you can use a hot shoe adaptor to add one. If you want to use more than one flash, you need the sync jack splitter to plug them into. If you have questions, call or send us an email. The easy way to get started with water drop photography. You also need a cable for each flash you want to use, and a shutter cable for your camera. The water valve is not attached to the bottle, so you can riase or lower the bottle. The valve is an improved "industrial" type. If you already have a Time Machine, you can buy just the Drip Kit and a firmware chip to add the Drop Mode to your Time Machine. Note: This is needed ONLY if you already have an older Time Machine and want to add the Drip Kit. The chip is in a socket and easy to replace. Postage for a Time Machine via UPS ground in the U.S. is about $15, depending on what you order and where you are. Overseas shipments commonly cost about $50. We don't know the exact charges until the order is ready and weighed. Insurance value is limited to some countries, and some may charge a duty or VAT on delivery. We find it necessary to confirm that orders are placed by real people and not automated programs. Please enter the word that is shown below. This will email your order to us. Remember, we will reply within 24 hours (we may not respond on week-ends or holidays). If you don't hear from us, we didn't get your order! To cancel your order and remove all entries, click on the RESET button.